May May has diverse experience in legal, corporate communications and human resource. May May has over 24 years-experience in the legal industry specialising in corporate advisory, capital markets, restructuring, banking, property and litigation. In the course of her career, she also has working experience in corporate communications which includes advising on investor relations, corporate communication strategy, building media relations, crisis communication and drafting corporate brochures, annual reports, corporate videos, websites and social media sites. For human resource, May May has experience in HR operations, HR transformation, talent retention and management. Prior to starting ZICO Insource, May May was a partner in Zaid Ibrahim & Co before she retired from the partnership in 2005. 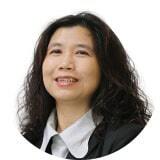 She then led as Head of Legal & Corporate Services and General Manager, Group Project Operation of Media Chinese International Ltd before joining Dialog Group Berhad as the Head of Group Corporate Communication and Acting Head of Group HR.